At last we have come to the end of the journey. No more guessing; no more wondering; no more pieces to the puzzle. All has been revealed at last. 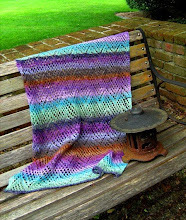 Most of all, I want to thank all of you: my readers & knitters. There have been a few bumps along the way (OY! ), but without your dedication, generosity, and incredible talent & knowledge, this experience would have been much diminished for all of us. I have never met a more amazing group of individuals, nor seen a more beautiful collection of finished objects. You are absolutely the best! 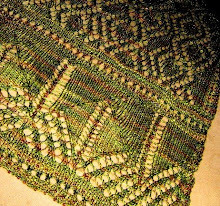 A central medallion of Evenstar stitch is surrounded by a second ring of woodland leaves and mesh, inspired by the work of Herbert Niebling. The third ring of the pattern evokes images of the arched doorways & windows of Rivendell, before returning to the Evenstar motif, this time surrounded by a blooming flower and elongated as in the Evenstar necklace itself. 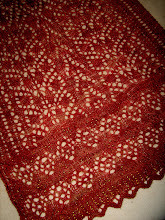 Upon completion of the main part of the shawl, directions are given for a beaded (optional) lace edging around the outside of the shawl. 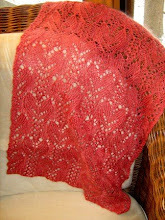 This is a circular shawl. 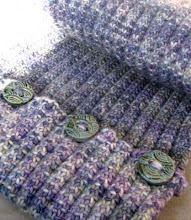 You begin at center and knit around in spiral fashion until you reach the outer edge. 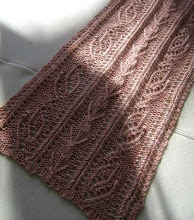 You are always knitting on the right side of the fabric, until you reach the final border. 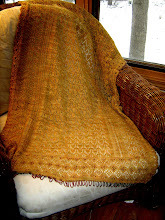 Shawl uses PI configuration of doubling your stitches every so many rows, rather than increasing on each round. Increase rounds are between charts. For better or for worse (and there has been plenty of both) here she is: complete at last! May she bring her wearers justified pride in a job well done, the inherent joy to be found in all creative and generative activities, and hope for a future free from conflict and woe. Thank you Susan for sharing your vision with us. It is beautiful! 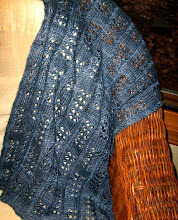 It is one of the most beautiful things I have ever made and I am inordinately proud of it (and myself!). It is stunning. 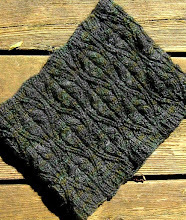 I can't wait to knit it. Thank you so much for this opportunity! 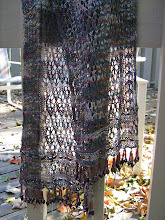 The incredible beauty and paced challenges have allowed me to grow as a knitter and as a person (and to show off a bit, too). 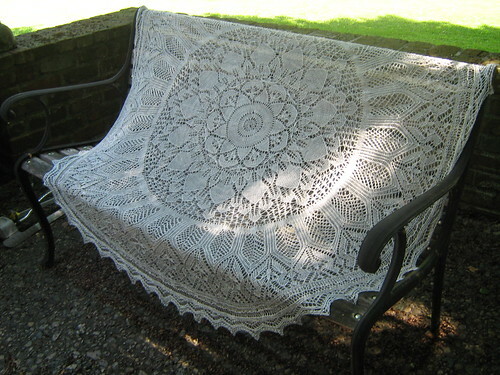 Thank you for a beautiful pattern! 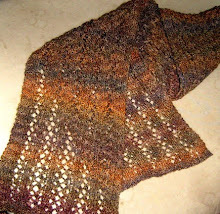 I am amazed at myself for actually be able to knit this masterpiece you have created for us! I really enjoyed the whole KAL! Thank you so much! It's amazing, thank You so much for this creation. 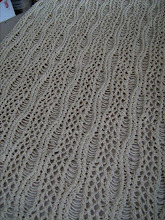 I cant wait to knit it! AWESOME!! I'm in the Evenstar Rav group, even though I joined too late to get in on the clues. I'm off to purchase! Thank you! 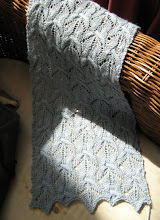 Even though I will probably never knit the pattern, I think it is gorgeous. I must say, this is absolutelygorgeous and I hope to make this some time soon.